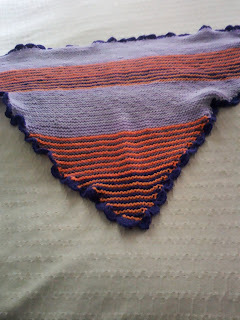 So my Shawl is all done yes already and it is only 13th July. I sorted out Orange, Purple, Lilac and variegated yarn that went with the other colours. 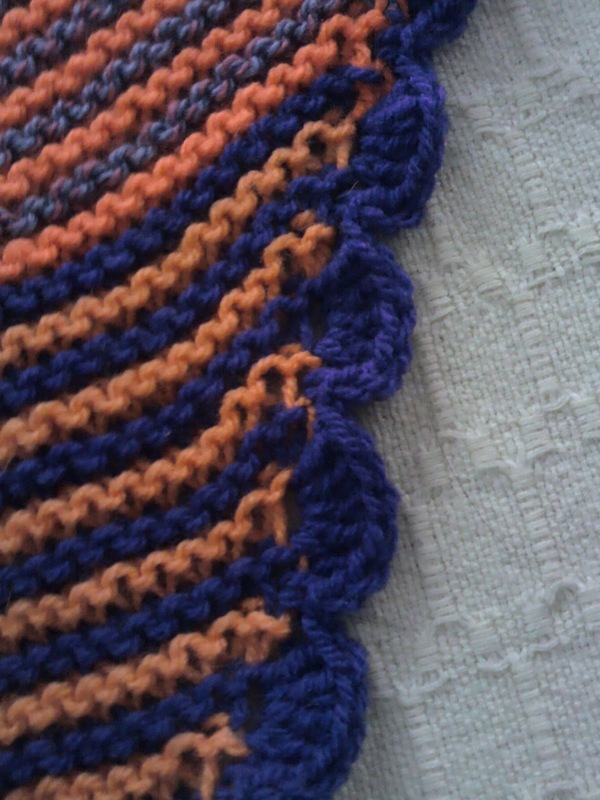 A simple pattern of cast on 3 Kfront and back of first stitch knit to the end of every row. All I was change colour every two rows to give the stripe, easy, I just kept going until the needle could not hold any anymore stitches and bound off. Yarn was DK and needle size 6mm 40cm long, I don't get on well with cable needles I can easily twist the stitches and that is annoying. Now before you say anything this is my very first Crochet edging in the Shell pattern. Not that hard in the end and remember I do not crochet. I can just about do an edging on something knitted but to crochet something means following a pattern and crochet patterns are so different from knitting patterns that I find them hard to work out. With practice I may be able to make something simple but knitting is thing. 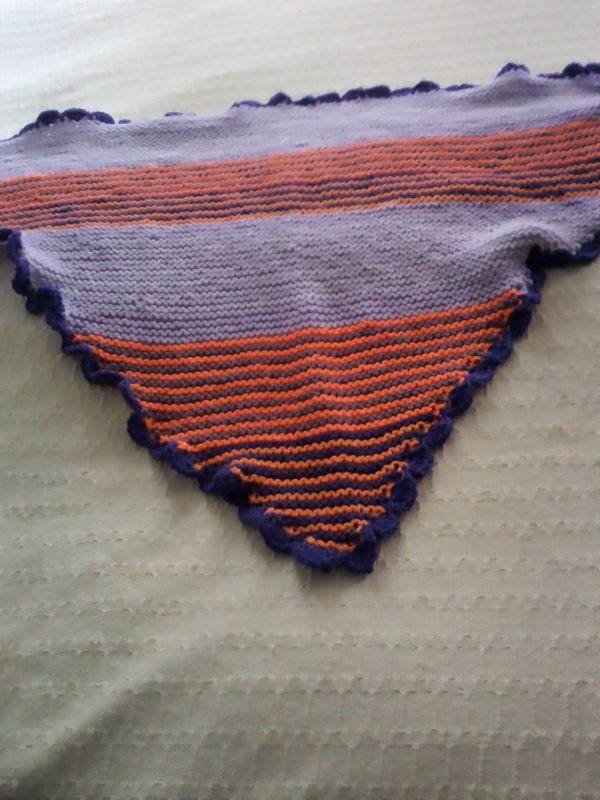 I was quite pleased with how it looked and it sets off the simple knit shawl nicely. Each side is a different colour and the wave pattern looks interesting as it adds a new dimension to the usual stripes. Now for the Teddy who is in the bag. Kinda cute isn't he, a cuddly surprise in a bag. Now why did I do this? well not everyone who is has Cancer is an adult, children need comfort as well. Yes I know they have their own toys but sometimes a new toy that is there waiting for them is special as it can be taken into the treatment room with them. This little guy has his own bag so he can be stored away and taken out when he is needed. My second shawl has been started and this time the pattern is my own. I am using DK yarn and 9 mm needles. 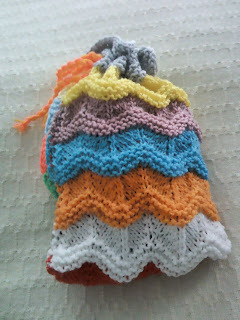 I will be using orange and yet allow yarn so I will change colours on row 3. Changing colour every 2 rows makes the colour change easy. 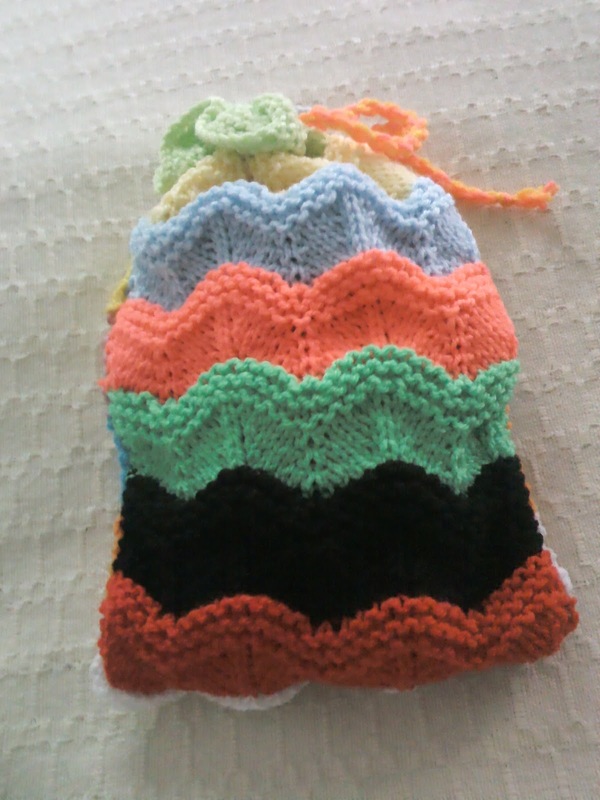 You can add a new colour easily on row 3 as well so the pattern will accommodate my stash. I will post a picture of the shawl as I knit it showing my progress. I'm new to crochet as well and keep meaning to try the scalloped edging. Your's is great. Thanks for the link to the instructions. Crochet is something new for me and I find Youtube a great way to learn as written instructions don't make much sense sometimes. 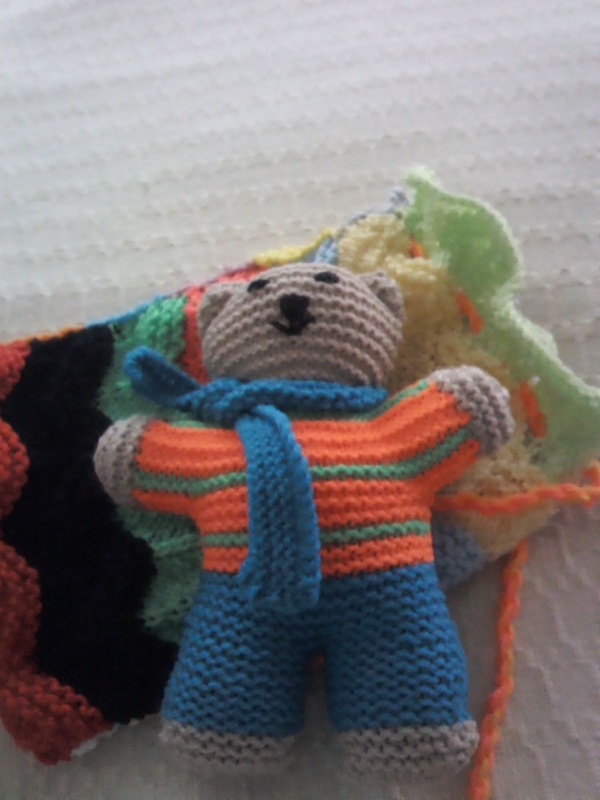 Thank you I like making the Teddies they are easy to make each one is different and a great way to use up odds and ends of yarn.